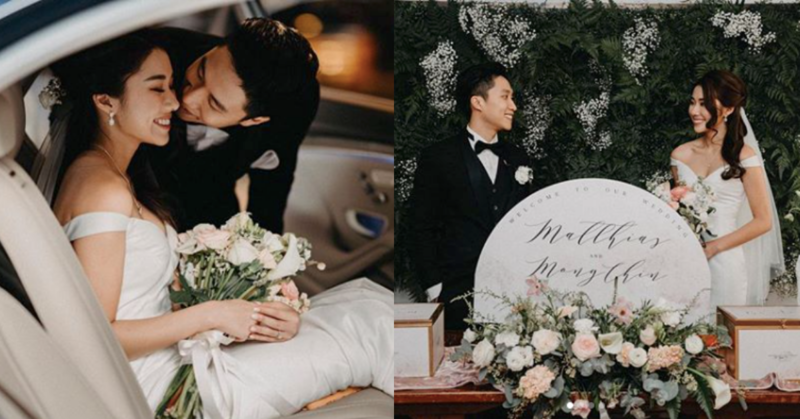 The M&M couple officially tied the knot last weekend after their engagement back in December 2017. The eventful day took place in True Way Presbyterian Church where the beautiful couple emerged as together as Mr. and Mrs. Matthias Lim. The church solemnization ceremony turned out to be the perfect setting for a romantic wedding filled with soft hues and greenery-floral backdrops. The bridesmaids were dressed in an all-dusty-pink ensemble that just makes the best bridesmaids squad! Not to forget, Mong Chin’s girl gang were also there to witness her big day! As for their wedding banquet at night, the couple marched in together as lawfully husband and wife. Our hearts are definitely are filled with love as this sweet couple embark their next new chapter together after 7 years of courtship! And forever starts now… May they live happily ever after! Do check out #MattlyinlovewithMong on Instagram to get more snippets on the wedding day & here’s wishing this lovely couple a lifetime of love and happiness!